See Australia Month-by-Month Part One: January to June Travel Teasers! The Ultimate Beginners Guide to Limestone Coast Attractions – Part Two! 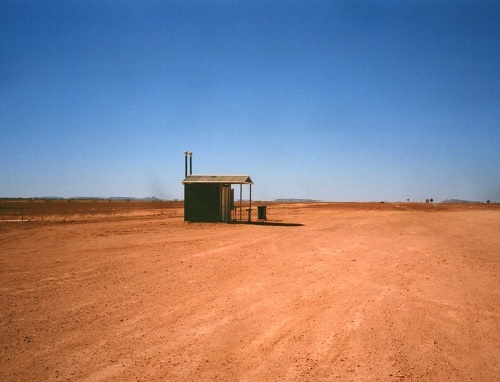 Welcome to the home of Aussie Loos with Views! the tell-all book and unique Australian travel guide with over 60 of the most pleasurable places to do ‘business’ in OZ! 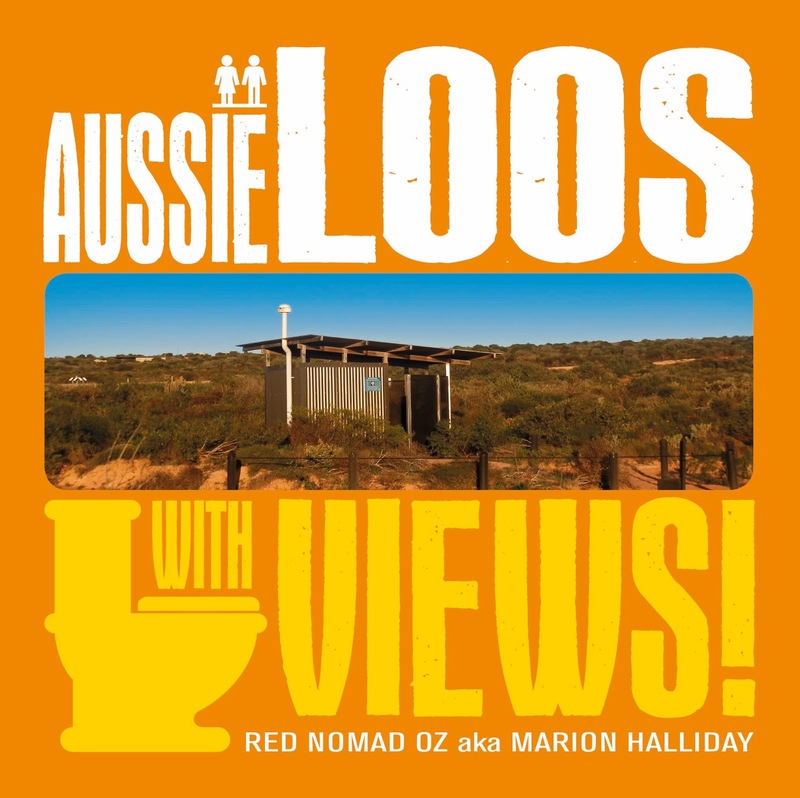 I’m Marion Halliday and as Red Nomad OZ – arguably Australia’s best known loo lover and outhouse observer – I’ve been showcasing Aussie Scenic Public Toilets for over five years right here on my website, now updated from Amazing Australian Adventures to RedzAustralia! If you can’t find it in your favourite on-line or actual bookshop, then click HERE to purchase direct from the Explore Australia bookshop! How did the Scenic Loo thing start? 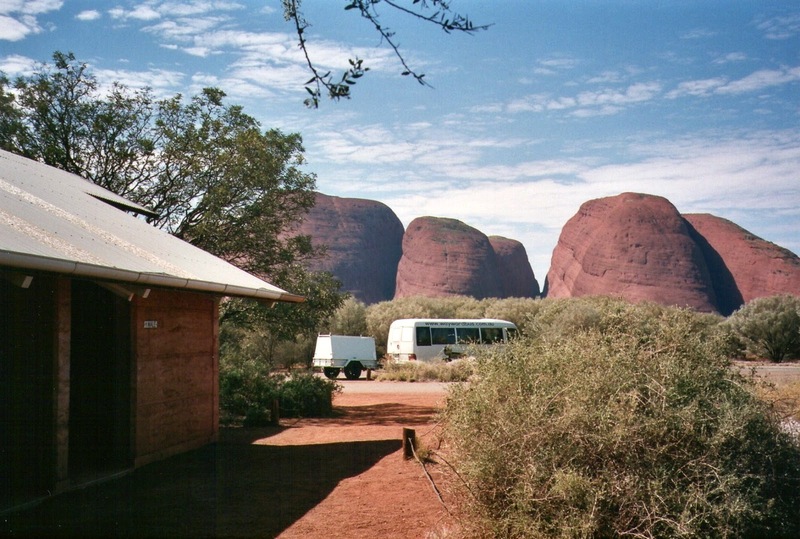 A few years ago, we pulled into the Kata Tjuta carpark and picnic area where I used the amenities before heading out on the walks. From the doorway, the awesome rocky domes were right there in front of me. This was – and still is – one of the most stunning views from a convenience block I’ve ever seen! But was it Australia’s finest? I didn’t know. And no one else could tell me. So I started looking for myself! 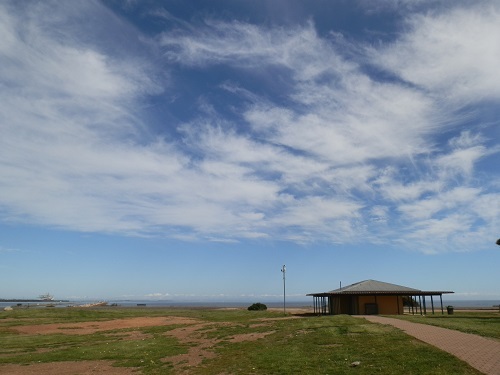 When I started my blog over 5 years ago, my regular travel series featuring Australia’s Scenic Public Toilets were my most popular posts. Then came the calendar – now in its 3rd edition with Dunnies of Distinction! And then came the book! Aussie Loos with Views! features more than 60 hand-picked scenic loos from all around the country complete with colour photographs and commentary. 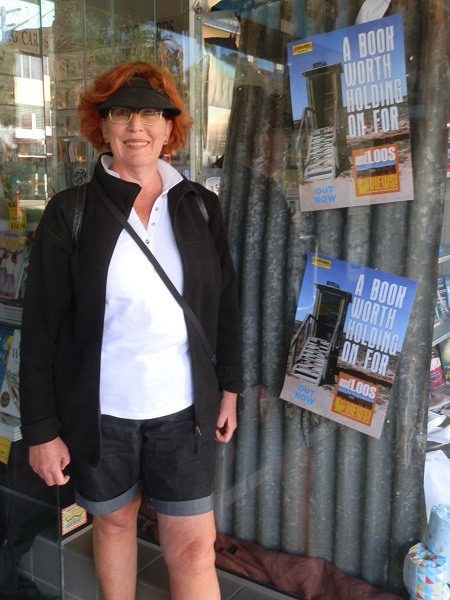 The book includes two loos that even I haven’t seen yet – Yvonne Newman’s photos of the wonderful loo that takes ‘scenic’ to new levels at Tarkine Forest Adventures; and Rick Coxhill’s photo of the Pelion Plains loo – with (arguably) the most expensive waste in OZ – on the Overland Track. I look forward to discovering these for myself when I’m next in Tasmania. Read Aussie Loos with Views! and you’ll be on a Great Aussie Loo Tour via the attractions of many regional and rural areas all around Australia. Is this Australia’s ULTIMATE Travel Guide?! That’s nice .. but what’s that got to do with me? Your father missed out on it for Father’s Day, so you’d better get it for him for Christmas! Does the world really need another celebrity chef cookbook? YOU want to take the Great Aussie Loo Tour! No one at home will believe there’s actually a book about Aussie loos! It’s SO cool, it’s HOT!! You need something to go with your Dunnies of Distinction DOWNUNDER! Calendar. You saw me on Weekend Sunrise! Get a copy before the next print run and it’ll be a collectors item. Buy this book – and there just might be a second one!! You heard about it on the radio and you want to see the real thing for yourself. If the Aussie economy is heading down the toilet, you’d like to see where it might end up! You want to be a dunny detective too! It’s never too early to start your Christmas shopping! The 2nd print run just MIGHT run out before you get YOUR copy. You want to watch people’s reactions while you’re reading it on the train. Or bus. Or ferry. Any other reasons? Let me know in the comments below! The recommended retail price is $19.95. Try your local on-line or actual bookstore! My first in-store book sighting (see left) was at the Book Warehouse in Lismore, New South Wales with an AWESOME display including an old tin dunny, extra ‘special’ loo paper and posters! I even signed a few copies there! If you’re having trouble tracking down a copy, go online to the Explore Australia Bookshop NOW! Where do I find even MORE great Aussie Loos with Views? 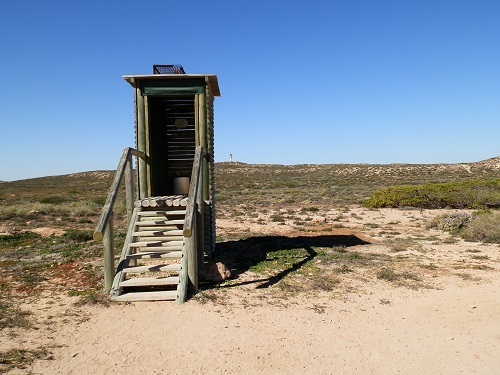 I’ve discovered even more outrageous outhouses, fabulous facilities and dunnies of distinction on the road – I’ve stumbled across some of them by ‘accident’ – so I’m already thinking about ‘Aussie Loos – Number Two’! And there’s a NEW Calendar on the way for 2016. But being the go-to girl for Aussie loos – I’m a toilet tragic with a travel habit and above-average dunny detection skills – means I’ll keep tracking them down! In the meantime, why not check out the loos I’ve discovered already right HERE on RedzAustralia! Like that true Aussie loo in this photo from Andamooka?! Stay tuned! I’ve got a LOT more Aussie loos with Views to show you! I’d love to run a feature on the book on my blog – although people are seriously going to think I’m toilet obsessed as I have toilet restaurants, toilet tours and toilet cocktail bars on there already. Do I need to go through you or speak to a publisher? Drop me a line back on the email below if you’d be keen and we can discuss (maybe running mid-Nov to tap into Xmas sales). This is so creative and wonderful. I love the concept behind it. It would make the perfect gift for a lot of people I know. Bookmarking this. Cheers!! Haha, I think that app would be out of date before it even got off the ground, Donna!! Actually, it was suggested that I call my follow-up book ‘Aussie Loos – Number Twos’! What do you think? Haha, great idea Sandy N Vyjay! But I wonder how many facilities are THAT close to those attractions? I’ve always thought us Aussies had cornered the market in placing the dunnies right up close to our natural attractions – but maybe I’m wrong!! This is Aussie humour at it’s best – or worst, depending on your point of view, Gina! It’s the quirkiest travel guide in OZ, and it’ll make you gag in more ways than one, haha! This is such a unique idea and seriously a great gift idea for my father! It’s a great gift for almost anyone and almost any occasion, Sherianne! In my humble opinion, of course!! This would make such a great Christmas present, sitting around getting some serious travel inspo whilst having such a laugh with my family! Thank you Nuraini! So glad you like it – not everyone ‘gets’ Aussie humour!! Great idea for the e-book – I’ll have to talk to my publishers!! Hilarious! I tend to find amusement from quirky loos too… and drive my daughters mad when I come out of one exclaiming how clean and pleasant it was, with a rating out of 10! It stems from a vivid memory of my Mum exiting a loo managed by the hydro company in Central Tasmania, I must have been about 10 years old- she was so impressed she said dinner could be eaten in there it was so clean! We did not eat dinner in there though! So, quirky and clean… top of my list! Hi Jane! That’s fantastic!!! I wonder is that Tassie loo still there??!! It’s amazing how many good public loos there are out there – of course my book doesn’t show the skanky ones 🙂 Thanx for dropping by – and watch this space! I’ve got a LOT more loos to show off! !